Probably never before has there been more scepticism about the merits of the rink's pantomime than was felt by many before the first night of The Knights Before Christmas. Doctor Who and the Millennium Quest in 1999 proved that what the public wants is a traditional panto, however restricted audience participation might be because of the constraints of a pre-recorded soundtrack. While the loosely-based Round Table story may not have been to everyone's taste, the flow of this year's production (less dialogue and more skating action) went a long way to redressing the problem of not having a traditionally popular storyline … and to making the show so successful. Praise for this is due almost entirely to the club's Mr Pantomime, Paul Minchinton, who has been involved behind the scenes since he made the Dalek for the 1999 show. He contributed enormously to last year's A Christmas Carol and even returned to the set the day after he broke his cheek when he slipped and fell on the backstage ice. This year he not only devised the show and wrote the script, but produced it in collaboration with rink manager Tim Newton. When he wasn't overseeing on-ice rehearsals, he was busy backstage with scenery and props. In fact there can hardly have been a minute in the past year when the show did not impinge on his life in some way. It was only fitting, therefore, that he should be this year's recipient of the Roy Albrecht Trophy. 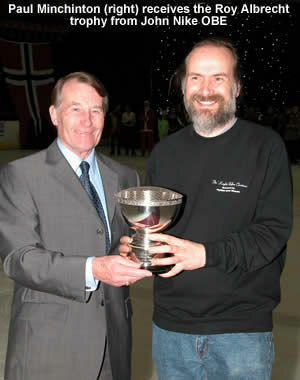 In memory of a former club chairman, the cup is awarded annually for endeavour on the ice or services to the pantomime and is usually presented to an adult. While the show would not have gone on without Paul, another club member, Louisa Hicks, became a hero when she stepped in at very short notice to take Kira Geil's role as Guinevere in addition to skating her own part as Nimue. As usual, club president, John Nike OBE, presented £500 at the last performance of the show to club chairman Roy Welham. This annual boost to the club's funds is in recognition of the club's contribution to the pantomime. 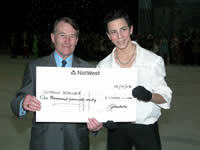 And Mr Nike announced he would be donating a further £5000 to the trust fund he unveiled last year to help create figure and ice dance champions.He also presented a further £1000 to Simon Waller, 16, who he has been sponsoring for two years in his bid to represent Great Britain in the men's figure skating event at the 2006 Winter Olympics. A big thank you for all your efforts towards the show, without all the time you give towards the show it would be impossible to stage it. I hope that you all feel, in the end, you get more out of the show than you put in and are keen enough to contribute again next year (book early to avoid disappointment) !With the hundreds of people contributing to the show it seems wrong to name any one person - but I would like to thank Louisa for answering my phone call of panic on Sunday night and stepping into two roles. If you have any suggestions which you think will benefit the staging of the show next year drop me a note - either to reception or by email to icepanto@ntlworld.com. Have a relaxed and stress free Christmas!